Amanda has been a Veterinary Assistant at AEC since 2016. She is also enrolled in the Veterinary Technology Program through Penn Foster college in pursuit of her Veterinary Technician Associates Degree. 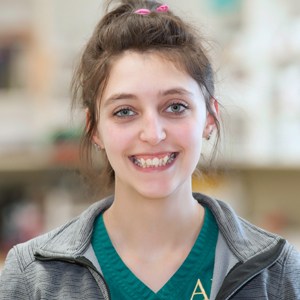 Prior to joining AEC, Amanda worked at the Michigan Humane Society - Detroit Veterinary Center. After Amanda completes her degree she wishes to persue a veterinary emergency speciality certification. Amanda has had a love for animals since she was a little girl. She used to bring home strays because they had no place else to go. Now, Amanda has a great love for emergency medicine. "I enjoy the fast pace and that not very many of our cases are "routine" - there's never a dull moment. Being able to help the animals when they are in need, and being able to see them get better and go home is the most incredible feeling in the world. I absolutely love what I do, and would not change it for anything!" Amanda has two pets at home. Olive is a brindle and white Pit Bull that Amanda began caring for when Olive was a 3 month old puppy. Olive came from a rough background but is the sweetest dog that you will ever meet. She enjoys sunbathing in the yard and sleeping on her puppy bed. Amanda's fiance Daniel has a German Shepherd, sable police canine partner named Ike. Ike is nationally certified in explosives and aggression and actually finds explosives for a living. Ike and Daniel won a national award in 2015 for finding a weapon at the Auto-Show at Cobo Hall in Detroit. When Ike is working, he is strictly all business, but when he is not working he is a VERY sweet boy. Ike enjoys being active, working, and playing with his toys. "Ike and Olive are best friends furrever, and I would not know what to do without either one!"